Hollywood moms love Biscotti boutique apparel for little girls, and you can afford the Biscotti brand, too, at Adorables Children. Tom Cruise’s darling daughter has been photographed wearing Biscotti, and Biscotti was the brand worn by President Obama’s charming daughter at the White House. It’s the exquisite craftsmanship and attention to frilly, feminine details that make American-made Biscotti a chic choice at upscale children’s boutiques around the world. Biscotti dresses in little girls and teens sizes are perfect for special occasions and those keepsake photographs that will delight you and her for a lifetime. Biscotti has beautifully tailored silk gowns with matching bonnets for baby christenings, baptisms, holidays and other very special events. Adorable little girl dresses and two-piece sets are chic, but comfy, too, to celebrate a child’s sense of play. “With headquarters in the beautiful San Francisco Bay Area, our whimsical and romantic apparel collections have captured the hearts of customers since 1986,” say the founders of this beloved children’s boutique brand. 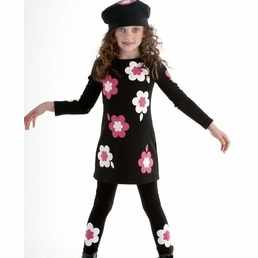 You’ve probably already seen Biscotti little girl’s apparel styles like those in our famous-maker children’s wear collections depicted in the pages of Women’s Wear Daily, Vogue’s Italian editions, US Weekly and other leading magazines. Like San Francisco architecture, Biscotti melds classic and contemporary to create this children’s fashion house’s signature looks. Shop our casual to very dressy outfits from the best of Biscotti. Because the brand is recognized around the globe, it’s a favorite gift from grandmothers, aunts and friends for baby showers, first birthdays, holiday giving, and celebrations of the transitions from infancy to girlhood to those first teenage years. The world’s best-known luxury boutiques and department stores carry this brand, but not with the selection, sizes and competitive pricing you’ll find at Adorables Children. We also print brand-specific size charts on each page to help you choose that perfect fit. Join our newsletter list to receive exclusive sale announcements, and read about our next beautiful Biscotti fashion find. See the entire Biscotti Collection here!